This article is the last in a series offering an explanation for how distant starlight could be visible from an earth that is only thousands of years old. Drs. Vardiman and Humphreys have contributed their considerable scientific expertise in presenting a creationist cosmology that seems to resolve this question. To read the entire series, visit www.icr.org. In this third article we will describe the implications of Humphreys’ cosmology in more detail using a composite figure that illustrates the effects of stretching the heavens on earth time, cosmic time, and the location in space. We will also discuss a possible second time-dilation episode associated with the Genesis Flood and some independent evidence for Humphreys’ model. Figure 1 shows a plot of earth time and cosmic time versus distance from earth. Earth time in thousands of years is shown on the vertical axis to the left side of the diagram and cosmic time in billions of years to the right side. Cosmic time is defined as the time it takes light to travel to earth without any stretching of space or other cosmological adjustments. The distance through space is given in light years. (A light year is equivalent to the distance light travels in one year at 186,000 miles/second, or about 5.87 x 1012 miles.) Light takes only about eight minutes to travel from the sun to earth, but over four light years to travel from the nearest star (Alpha Centauri). The farthest object in space observed by the Hubble telescope is estimated to be about 13 billion light years away and, consequently, the cosmic time for its light to reach earth would be about 13 billion years. However, earth time could be considerably less, according to Humphreys’ model. 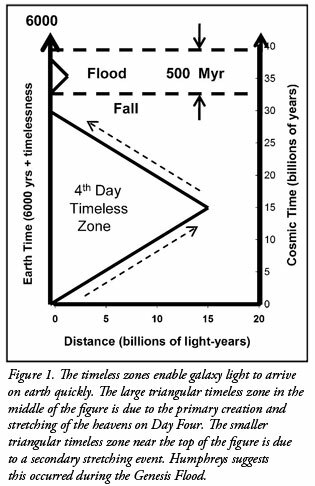 Ignoring the upper part of Figure 1 for the moment, the large triangular area in the center of the diagram shows the timeless zone that developed during the time that God created the galaxies and stretched space outward. It would be helpful for the reader to review the portion of the second article in January 2011 where we suggested that God designed or adjusted three factors that affected the timeless zone so that the expansion speed of the timeless zone surface was equal exactly to the speed of light. The other two factors were made constant to get a constant speed for the expansion of the timeless zone. For an expansion rate equal to the speed of light, the timeless zone would follow closely behind the wave of galaxy creation, also proceeding outward at the speed of light. As the zone reached and engulfed each new galaxy, time stopped for them. The trace of the timeless zone shown in Figure 1 would move from the lower left corner of the diagram (0, 0) [cosmic time] upward to the right center of the diagram (15, 15) [cosmic time]. When the wave of creation stopped, say at the location of the waters above, suppose that God now increased the tension, and the critical potential line (shown in Figure 3 of the second article) moved downward. As it did so, the radius of the sphere of timelessness decreased. Again, let’s imagine that God set the values of the three factors to cause the timeless zone to contract at the speed of light. As each galaxy emerged from the receding timeless zone, it resumed emitting light, some of which would shine inward toward the center. Because the timeless sphere was contracting at the speed of light, the inbound light would follow right behind the sphere as it shrank. When the sphere reached zero radius and disappeared, the earth emerged from the timeless zone, and immediately the light that had been following the sphere reached earth, even light that started billions of light years away. The stretching of the fabric of space had been occurring continuously all along the light trajectory, thus red-shifting the light wavelengths. The trace for the timeless zone during this phase of the process moved from the right center of the diagram (15, 15) [cosmic time] to the upper left corner (0, 30) [cosmic time]. Within the timeless zone on earth during Day Four of creation, the galaxies in space would have been created and wound up, large amounts of radioactive decay would have occurred, and light would have traveled long distances from the far reaches of space. On earth, time was at a standstill during this process. The other verse is 2 Samuel 22:10. It is identical, as the whole chapter is nearly identical to all of Psalm 18. The repetition suggests that the psalm is quite important. In it, David reminisces about how the Lord has rescued him from dangers. In this section of the psalm, he speaks in terms of a cataclysmic event that appears to be the Genesis Flood. Everywhere else in Scripture, the phrase here translated “bowed the heavens” is translated as “stretched out the heavens.” The primary meaning of the Hebrew verb natah is “stretched.” The translation “bowed” is far down the list of possible secondary meanings. Humphreys prefers the primary meaning, which suggests that God stretched out space at a higher-than-usual speed (as measured on earth) during the Genesis Flood. Scientific considerations applying to the Flood suggest that time dilation occurred during this event of space stretching, and it helps explain why the stretching would appear to be very rapid as seen from earth. At the top of Figure 1 is a triangular region that occurred 1,656 years after the creation event during the year of the Genesis Flood. The expansion and contraction of this region was slower than the speed of light and only extends out to a distance of, say, a few hundred thousand light years. During the Flood year, if Noah could have seen the night sky, its appearance would have changed quickly. With a suitable telescope, he would have seen the galaxies grow older by about 500 million years (i.e., spiral galaxies would be more wound up, stars would have evolved on the Hertzsprung-Russell [HR] Diagram, supernovae would have expanded quickly, etc.). This second time-dilation event, combined with the speed-of-light recession speed of the timeless zone, explains why distant galaxies, especially spiral galaxies, look no younger than nearby ones. This scenario illustrates the usefulness of achronicity. Because earth was in a timeless zone during the two space-stretching events, there is a major difference in the way clocks functioned on earth and in deep space. We aren’t speaking of just a minor difference. For example, if the creation of earth occurred about 6,000 years ago in earth time and the creation of objects at the edge of the universe occurred about 15 billion years ago in cosmic time, then there is a factor of about 2.5 million between the two estimates of time. This means the earth-time scale on the left side of Figure 1 cannot be drawn to scale. Time on the earth-time scale probably flowed at the same rate we observe today for about 1,656 years from the seventh day of the creation week to the Flood, and for over 4,000 years from the end of the Flood to today. The earth-time scale is compressed compared to the cosmic-time scale and has periods of timelessness in it. The conventional Big Bang cosmology hypothesizes that the expansion of space disperses the stars and galaxies as if they were on the surface of a sphere rather than radially from a point in space. Humphreys conducted a study of the positions of stars and galaxies throughout space and found that they were distributed in quantized concentric shells centered on our home galaxy.6 The probability of the earth having such a unique position in the cosmos by accident is less than one in a trillion. Since Big Bang theorists presuppose the cosmos has a naturalistic origin and cannot have a unique center, they have sought other explanations, without notable success. This distribution argues against the Big Bang theory and supports Humphreys’ solution upon which time dilation produces timeless zones that reconcile earth time and cosmic time. But, probably Humphreys’ most convincing piece of evidence to support his model is his explanation for the Pioneer effect,7 an unexplained apparent anomalous acceleration of the Pioneer 10 and 11 spacecraft toward the sun. If a large volume of empty space surrounds the matter of the cosmos, so that it can have a center of mass, then the matter is in a deep gravitational potential well. If space is expanding and spreading the matter outward, then the depth of the well is decreasing. According to Humphreys’ new solution to Einstein’s equations, the decreasing depth continuously shortens distances measured by radar within the well, causing the observed acceleration. The magnitude of the anomalous acceleration implies the bottom of the potential well has not yet risen very far above the critical depth for gravitational time dilation. Thus, the Pioneer effect supports the essentials of several creationist cosmologies: a center of mass, expansion of space, and recent time dilation. Big Bang theorists, whose cosmology does not have a center of mass, cannot use this explanation. Vardiman, L. and D. R. Humphreys. 2010. A New Creationist Cosmology: In No Time at All Part 1. Acts & Facts. 39 (11): 12-15. Vardiman, L. and D. R. Humphreys. 2011. A New Creationist Cosmology: In No Time at All Part 2. Acts & Facts. 40 (1): 12-14. Humphreys, D. R. 2000. Accelerated Nuclear Decay: A Viable Hypothesis? In Radioisotopes and the Age of the Earth: A Young-Earth Creationist Research Initiative, Vol. 1. Vardiman, L., A. Snelling and E. Chaffin, eds. El Cajon, CA: Institute for Creation Research and St. Joseph MO: Creation Research Society, 333-379. See especially pages 367-368. Humphreys, D. R. 2005. Young Helium Diffusion Age of Zircons Supports Accelerated Nuclear Decay. In Radioisotopes and the Age of the Earth: Results of a Young-Earth Creationist Research Initiative, Vol. 2. Vardiman, L., A. Snelling and E. Chaffin, eds. El Cajon, CA: Institute for Creation Research and Chino Valley, AZ: Creation Research Society, 25-100. See especially pages 70-74. Humphreys, D. R. 2002. Our galaxy is the centre of the universe, ‘quantized’ red shifts show. Journal of Creation. 16 (2): 95-104. Humphreys, D. R. 2007. Creationist cosmologies explain the anomalous acceleration of Pioneer spacecraft. Journal of Creation. 21 (2): 6170. * Dr. Vardiman is Senior Research Scientist, Astro/Geophysics, and Dr. Humphreys is Retired Associate Professor of Physics. Copyright © 2011 Institute for Creation Research and D. Russell Humphreys. Cite this article: Vardiman, L. and D. R. Humphreys. 2011. A New Creationist Cosmology: In No Time at All Part 3. Acts & Facts. 40 (2): 12-14.